I done the same last week, clearance isn't a problem fella. I've always had YTX14BS units in mine and I've never had any issues with it rubbing under the seat. I notice all the above bikes are the old shape. Does this taller battery fit post 04 bikes? anyone still keeping those old photos about the 12>14 battery upgrading on gen2? lithium batteries are great , a 14/16 amp/hour fits easily (lithium batteries pack more punch and are 1/10 th of the weight. got one of these on my rsv and it definitely spins the engine better than the old lead acid battery and saves 3kg. 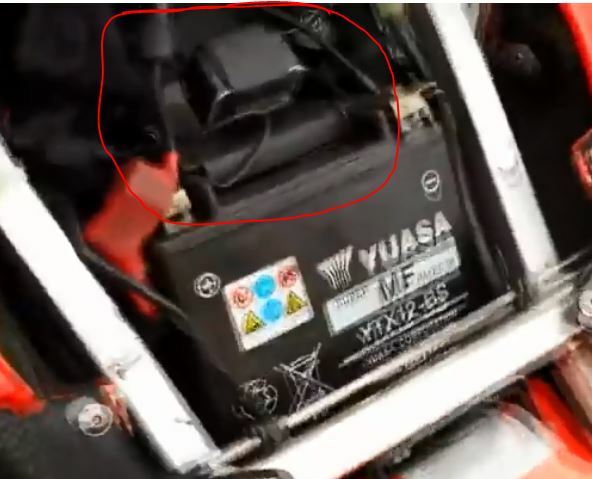 other that ytx12/14.. how do you fix/fit the tilt sensor on top of the other type batteries? The lithium battery 14 ah battery is smaller so no need to move anything. ic.. so no bother bout this sensor just straight screw in on its place? yes, check the dimentions of the old battery to the one advertised, it should be smaller or the same, then the tilt meter doesnt need move, lithium batteries although more expensive are great in their power delivery, lots of cold starting power. They also have a battery condition tester built in that shows (when pressed) the power held by the battery, and will save you 3kg of weight , estimate.